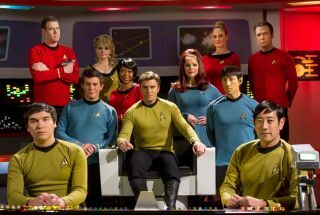 The crew of “Star Trek Continues” poses on the bridge of the starship Enterprise. The web series seeks to pick up where the five year mission of the original “Star Trek” series left off. "Star Trek Continues" is exactly what it sounds like: A fan-made science fiction series that picks up where the original "Star Trek" TV show left off, putting Kirk, Spock and the rest of the starship Enterprise's crew through a whole new set of adventures in the final frontier. The cast — made up of of talented voice- and stage-actor Trek fans, including Vic Mignogna as executive producer (and Kirk) — works on an exact-replica set, evoking the original show's performances to create what feels like lost episodes from the series itself. Since its debut in 2013, "Star Trek Continues" has published five episodes online, and the sixth will premiere in May. (Episode 7 is nearly done as well.) The project's crowdfunding campaign to finish Episode 7's post-production phase and film three more episodes is live on Indiegogo until May 4. Space.com: How did "Star Trek Continues" begin? Vic Mignogna: I've loved the original series of "Star Trek " ever since I was a little boy; I used to eat, sleep and breathe that show, basically. I would make my own uniforms and make my own props, and use my parents' movie camera to round up kids in the neighborhood to shoot little episodes. That show really inspired me when I was 10, 11, 12 years old, 13, 14. Over the years, I have been developing skills in filmmaking and acting, and all different elements of production, and a few years ago I helped another fan production — I directed an episode for another fan production, and I kind of got bitten by the bug again. So I got a bunch of friends together and we all poured a lot of love and money and sweat and time and effort and talent into starting this web series. And people have really enjoyed it. We've got over 4 million views now, and have won a dozen awards, and people seem to really, really be enjoying it and it's very gratifying. Space.com: How long did it take from the idea's inception to the first episode going up online? Mignogna: We started out by releasing some little 3- to 5-minute dramatic vignettes introducing the world to our crew and the actors that were going to be playing those iconic roles, and we released three of those vignettes. They're all online, they're on our YouTube channel. They were basically a preview while we were finishing building all the sets and getting ready to shoot the first episode. To date, we've been around three years and we've got six episodes: five online, released. The sixth one is done and will be premiering in May at Megacon, and the seventh episode is also done and will be premiering in the fall. Space.com: Has the project grown in scale over time? Space.com: How do you decide on the specific plots or issues to focus on for particular episodes? Mignogna: The original series' stories were very compelling stories that many times had an ethical theme or a moral plot or point or a social commentary, and so I was committed from the very beginning to telling those kinds of stories. And that's exactly what we've done. If you watch our episodes, you'll find that one of the things that makes [them] feel so much like the original series is that we tell very thought-provoking, intriguing, passion-filled stories. Space.com: Can you say what's coming up in episodes six and seven? Mignogna: I will tell you this: Our next episode is going to be so groundbreaking, nobody has ever done anything like this. I don't want to give away too much, but I will tell you that the engineering room will be featured prominently. It will be making its screen debut in Episode 6. Gigi Edgley, who was one of the main characters in Farscape, is our guest star for this episode. And let me just say that there was an element that they incorporated into several episodes of the original series, and no fan production has done this to the degree that we're doing it in Episode 6. And I will tell you that Episode 7 has already completed shooting. It's a wonderful, very, very thought-provoking episode about a very topical issue, and [I'm] very, very proud of that episode as well. Space.com: What has been the most difficult part of producing the show? Mignogna: Oh, my gosh, everything. I have to tell you, whenever you set out to do something at this level of quality, there are so many moving parts, and if you watch our episodes you see that there are tons and tons of elements to this production. Getting the lighting just right, getting the costumes just right, casting it, makeup, camera teams, sound team, props, art direction — there are dozens of moving parts that all have to come together to make it work, and I am so very, very proud of the team that I've assembled. The reason that we're able to do this quality-level work at a fraction of what it would normally cost is because everybody is basically doing it for virtually nothing. They're doing it because they love the original series of "Star Trek," they have a passion for it and they want to pay tribute to it the same way I do. Space.com: What was it like putting together the replica sets? Mignogna: The partial bridge was the only thing that had been built of all these sets when we partnered up [to work with another "Star Trek" fan production's set]. And then my director of photography, Matt Busey, did all of the diagrams and architectural drawings for all of the rest of the soundstage. And then a bunch of local volunteers, and just really good "Star Trek" fans, came together, including myself, and we all spent several months building all of the rest of the sets, and then three years ago we shot our first episode on those sets. So now — "Star Trek Continues" is the sole owner of those sets — we call our studio Stage 9, which is named after the soundstage where the original series was shot. Space.com: Was there anything particularly hard to put together? Mignogna: The pieces that were scattered all around the original soundstage were pieces from the 1960s; those pieces don't exist anymore. We need[ed] to come up with our own way to recreate and reproduce those pieces. And I'm very proud of the job we've done, doing so. Let me say, as amazing as our sets are, at the end of the day, the sets are just a backdrop to the story. If the story isn't any good, if the acting isn't any good, then it really doesn't matter how accurate the sets are. The only reason that our sets need to be accurate is so the audience will immediately accept the setting as the original-series Enterprise or the original series of "Star Trek," and then allow us to tell them a good, thought-provoking story. That's one thing that a lot of fan productions miss. A lot of fan productions build really nice sets, or they make nice costumes, but those things are merely a vehicle to tell a good story. As far as "Star Trek Continues" is concerned, story, story, story is king. That's the most important thing.